For Marketers, a Master’s Degree Can Be More Than A Piece of Paper. Two years ago, I was bringing a new manager up to speed on my experience and how I viewed my segment of the business, as well as my career. Of course, this being Microsoft and me being an overachiever, I made a brief PowerPoint deck to illustrate my points. When we got to the slide about my development, he fixated on one bullet point. In the past two years, I’ve thought about that conversation a lot, and the points I made. Earning a Master of Science degree in Integrated Marketing Communications was not easy. There were dozens of late nights and early mornings. There were fights with hotel and coffee shop Wi-Fi to get an assignment turned in. Hundreds of thousands of words written. 628 pages of papers with over 1,000 citations. The knowledge gained was not just from the research. Not just from the lessons. It was the offhand, informal perspectives derived from countless conversations. It helped me understand the mindset of entrepreneurs, students, small businesses, and large enterprises. At the office, it shaped the stories I told and the content I developed, and the strategies I nurtured. 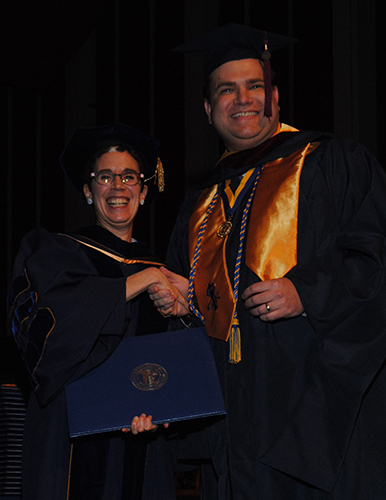 Joe Gura shakes hands with Maryanne Reed, Dean of Reed College of Media at West Virginia University during Commencement at Morgantown, West Virginia May 16, 2015. The page views went up. The video views increased. The content was sharper, better, more refined, and most significantly, more relevant to customers. You cannot get much farther outside the Redmond bubble than Morgantown, West Virginia, where three weeks ago, I got hooded, and took my walk across the stage to receive my Masters’ degree. For marketers who want to excel, and get to another level, the Masters programs aren’t just about the research, the papers, the grades. It’s about the people you meet, the relationships you forge, and the perspectives you gain. Take it from me: don’t just do grad school for the degree. Or to ask for a raise. Do it to get outside your bubble. …and think about doing it at WVU. They have a good thing going there. This entry was posted in Business, Career, Development, Leadership, Marketing and tagged Customer Centric, Digital Marketing, Grad School, Integrated Marketing, Internet, Marketing, Masters Degree, Technology, West Virginia, WVU. Bookmark the permalink.